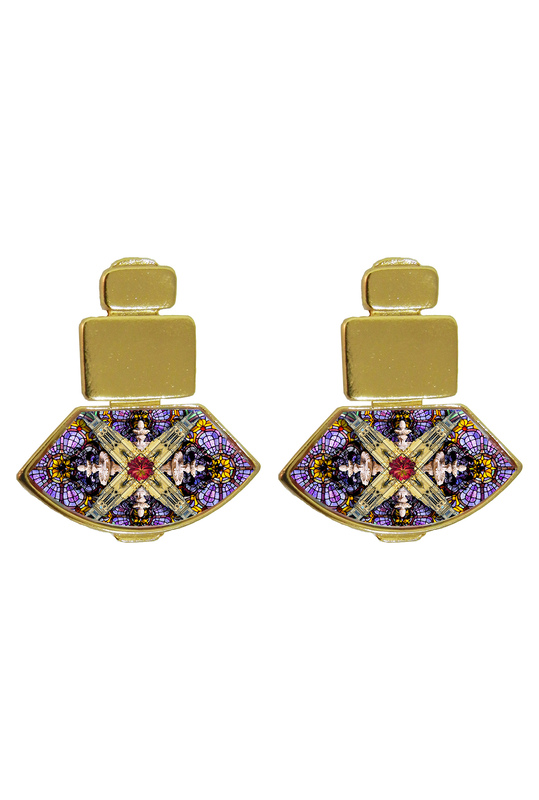 Both exotic and chic, these beautiful enamel Bogota earrings are a true statement piece. A charming church on the mountain Monseratte in the city center of Bogota served as inspiration for creating these 24k gold plated earrings. The beautiful church was built in the 17th century on a mountain considered sacred in pre-Columbian times. Today, it is still a pilgrim destination and a mayor touristic attraction. This unique and vibrant gem adds a jazzy flavor to any outfit – day or night – fusing the ease and carefree lifestyle of a gypsy with the sophistication of the yet set. For a fiercely glamazon and cheery effect, you can combine the earrings with a mix and match of multiple enamel bangles. 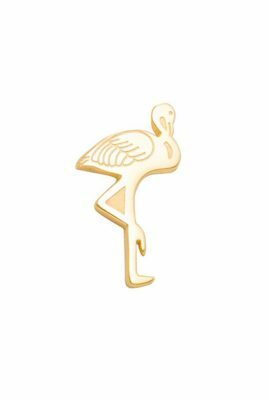 Product code: FA-AR-25-BOG Categories: Suggestions, Earrings. 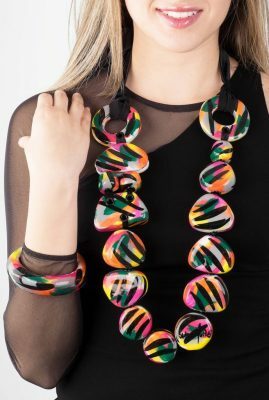 All jewellery of Flor Amazona are hypoallergenic and nickel free. The metals used are Gold, Rhodium and Silver plated brass and 316L Stainless Steel. Flor Amazona is the brainchild of Colombian jewelry virtuoso Ana Maria Sarmiento. Aiming to spread the magic of Colombia, she seamlessly fuses traditional pre-Columbian gold work with contemporary styles. As such, she has carved herself a fine niche in the crème de la crème of Colombian custom jewelry. Each and every one of her exotic, eclectic creations is handmade by indigenous tribes from the Amazonian rainforest. Working closely with the Wayuu and the Embera tribes, Ana Maria has made it her mission to keep alive and recode traditional Colombian handcraft. Thus, she provides these native communities with much needed educational support. 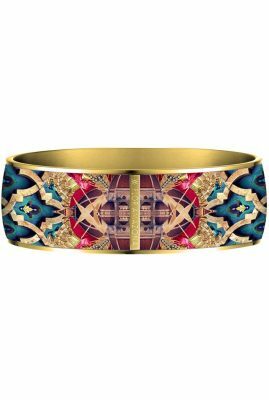 Both exotic and chic, this beautiful enamel Bogota bangle is a true statement piece. A charming church on the mountain Monseratte in the city center of Bogota served as inspiration for creating these 24k gold plated bangle. The beautiful church was built in the 17th century on a mountain considered sacred in pre-Columbian times. Today, it is still a pilgrim destination and a mayor touristic attraction. This unique and vibrant gem adds a jazzy flavor to any outfit – day or night – fusing the ease and carefree lifestyle of a gypsy with the sophistication of the yet set. For a fiercely glamazon and cheery effect, you can mix and match multiple enamel bracelets. The back exterior features a 24k gold plated Flor Amazona logo. Enameling is a delicate process. As such, it can take up three to four days to produce one single enamel bangle. 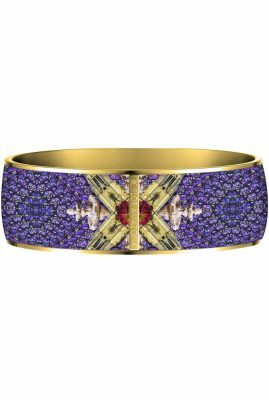 Both exotic and chic, this beautiful enamel Firenze bangle is a true statement piece. 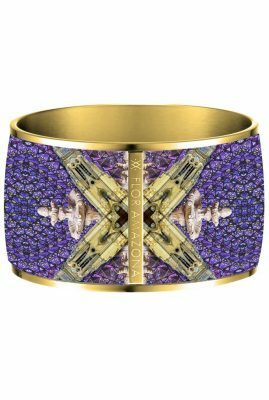 The Medieval Gothic style of the cathedral in Firenze and the amazing Brunelleschi’s Dome served as inspiration for creating the 24k gold plated bangle. This unique and vibrant gem adds a jazzy flavor to any outfit – day or night – fusing the ease and carefree lifestyle of a gypsy with the sophistication of the yet set. For a fiercely glamazon and cheery effect, you can mix and match multiple enamel bracelets. The back exterior features a 24k gold plated Flor Amazona logo. Enameling is a delicate process. As such, it can take up three to four days to produce one single enamel bangle. All woven and glass beaded wristlets are entirely handcrafted by indigenous tribes living in Colombia’s tropical rainforests. Each piece represents over twenty hours of handwork. 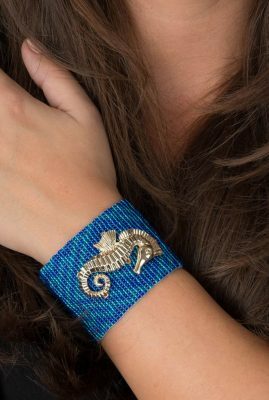 As a celebration to this native artistry, Tulum is an armlet inspired by the beautiful colors of the sea of Tulum in Mexico. By combining traditional bead weaving with 24K gold plated ornaments, these Latin luxe bracelets are captivatingly festive and unique.